PM Medvedev at the press conference. Russia warned the United States on Friday it would regard any US move to curb the activities of its banks as a declaration of economic war which it would retaliate against, stepping up a war of words with Washington over spiralling sanctions. Economists expect the economy to grow by 1.8 per cent this year. But if new sanctions proposed by Congress and the State Department are implemented in full, something that remains uncertain, some economists fear growth would be almost cut to zero in future. Moscow's strategy of trying to improve battered US-Russia ties by attempting to build bridges with President Donald Trump is backfiring after US lawmakers launched a new sanctions drive last week because they fear Trump is too soft on Russia. Separate legislation introduced last week in draft form by Republican and Democratic senators, dubbed "the sanctions bill from hell" by one of its backers, proposes curbs on the operations of several state-owned Russian banks in the United States and restrictions on their use of the dollar. 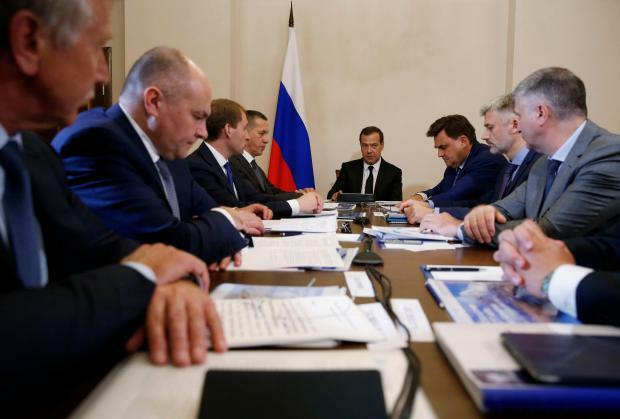 "I would not like to comment on talks about future sanctions, but I can say one thing: If some ban on banks' operations or on their use of one or another currency follows, it would be possible to clearly call it a declaration of economic war," said Medvedev. "And it would be necessary, it would be needed to react to this war economically, politically, or, if needed, by other means. And our American friends need to understand this," he said, speaking on a trip to the Russian Far East. The threat of more US sanctions kept the rouble under pressure on Friday, sending it crashing past two-year lows at one point before it recouped some of its losses. The Russian central bank said the rouble's fall to multi-month lows on news of new US sanctions was a "natural reaction" and that it had the necessary tools to prevent any threat to financial stability. One tool it said it might use was limiting market volatility by adjusting how much foreign currency it buys. Central bank data showed on Friday it had started buying less foreign currency on Wednesday, the first day of the rouble's slide. The fate of the US bill Medvedev was referring to is not certain. The full US Congress will not be back in Washington until September, and even then, congressional aides said they did not expect the measure would pass in its entirety.